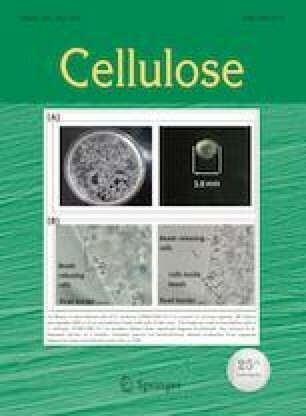 An integrated process of cellulase production and pretreatment employing Piptoporus betulinus was proposed to accomplish economic feasibility of lignocellulosic ethanol. After 24 days of cultivation, the maximum loss of weight and hemicellulose of rice straw was 21.25% and 24.79%, respectively. The cellulose was degraded slightly and exposed. Furthermore, the modified lignin led to the weak interaction between lignin and hemicellulose. The optimized enzyme production for CMCase activity (58.37 U g−1 substrate) and FPase activity (7.43 U g−1 substrate) were obtained on the 12th day and the 18th day, respectively. Whereas, the highest reducing sugar yield of rice straw (392.96 mg g−1) was obtained on the 24th day, which was 2.82 times higher than that of the control with the reduced cellulase dosage of 37.15%. In this study pretreatment, cellulase production and enzymatic hydrolysis were coupled into one process, which opens an avenue for environmentally friendly and cost effective technology in lignocellulosic ethanol production. This research received financial support from Key national research and development program (No. 2016YFD0300309), National Natural Science Foundation of China (No. 21868018) and (No. 21766025).